You can book, change or cancel your refrigerator repair appointment at any time online or over the phone. We’ll update you about your refrigerator repair appointment via text, email or phone–whichever you prefer. Sears Home Services performs refrigerator repairs for the top refrigerator brands, makes, and models. No matter the make or model, our refrigerator repair technicians are qualified experts in fixing all major refrigerator brands. QUIZ: Are You Guilty of These Refrigerator Food Storage Sins? Make sure that the power cord wasn’t unplugged by mistake. Confirm that it’s receiving power. If the light does not come on when you open the door, reset the breaker. If your home has a fuse box, check for a blown fuse and replace it if necessary. If it does not come on after resetting the breaker, make sure that the power outlet is working by plugging another item into it and checking for power. Look for an indication on the display that it’s running in Demo/Showroom mode and disable it if it’s active. When in this mode, the lights and display will be on but the refrigerator won’t actually be running. Refrigerators are sometimes delivered in Demo mode by mistake or it can be accidentally turned on when cleaning the display. Make sure that the ice maker is turned on—depending on your model, either move the switch/slide to “On” or move the wire arm down to the lower position. Make sure water supply valve to your refrigerator is turned on all the way. Clear any ice cubes that are stuck in the ice maker or dispenser chute. If you can’t easily dislodge the ice, try using warm water or a hair dryer to melt it. Make sure that the Lock Mode option isn’t selected on the display—this will deactivate the ice dispenser. A partially clogged filter can impact the refrigerator’s ability to produce ice so check and replace the filter if it hasn’t been replaced recently. Be sure that you’ve waited long enough for the temperature to change after you’ve adjusted the controls—it can take up to 48 hours. Turn off the ice maker if you don’t have a water supply connected to ensure that the refrigerator doesn’t lower the temperature to attempt to produce ice. If you’ve used a large amount of ice recently, the refrigerator may have lowered the temperature to produce more. Wait 24 hours and see if the temperature returns to normal. Check and replace the water filter if it is clogged. Refrigerators will automatically lower the temperature of the freezer if ice production is low, which can happen if water can’t pass freely through the filter. If the issue is happening in a crisper, meat, or deli drawer, adjust its airflow controls. Sliding the drawer’s controls to a colder setting will allow more air to flow to the drawer and keep the contents colder. If the condenser coil is accessible from the front of your machine (behind a removable grill near the floor): * Turn off your refrigerator and unplug it. * Carefully remove the grill and vacuum any dust that is under the refrigerator or on the grill. * Clean the grill with mild soap and water and put in back in place. * Plug the refrigerator in, turn it back on, and reset the controls to the desired temperature. Why choose Sears Home Services for your refrigerator repair service? Sears Home Services is your best, most-trusted option for refrigerator repairs and maintenance. With thousands s of local repair centers across the US staffed with technicians that are highly skilled, vetted, and guaranteed to fix all of your refrigerator repair needs, we are your best choice for any refrigerator repair, no matter where you bought it, including Kenmore appliances. Rest assured that we are experts at repairing the appliances in your home. What types of refrigerators does Sears repair? Refrigerator fixes may vary by type of the refrigerator. Common problems with French door refrigerators can include leaking and malfunctioning of the water dispenser and ice makers. On the other hand, wine refrigerators need to stay at optimal temperatures and occasionally don’t have consistent temperature levels as much as they should. Refrigerators used in the garage must endure a wide range of temperatures, working extra hard to keep contents cool in the summer and running properly during cold winter months. When your garage refrigerator is giving you trouble our local repair technicians are ready to assist. Give our refrigerator repair experts a call or schedule your refrigerator repair appointment online. What are some common problems with refrigerators that need repair? Of course there are other problems that can, and do, occur with refrigerators – if you’re having a problem that’s not listed here, you can always make an appointment with a highly trained, local Sears refrigerator specialist. Our local technicians are always near you – we come right to your house. 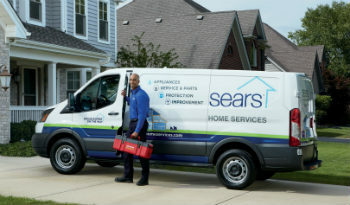 Did you know Sears Home Services fixes most major appliances, including refrigerators, and HVAC systems? See everything we repair.